Compatible with Translator and Expander modules, the patented chamber ensures optimal sensitivity from all directions. The double dust trap provides the chamber with increased protection from airborne contamination and background illumination. Each sensor is fitted with a reed switch facility, allowing testing using a magnet. Class A1R (58°C max) or Class BS (78°C) high-temp classifications. 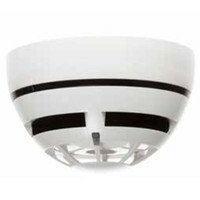 Twin alarm LEDs for 360 deg visibility.